I used three cut files. I cut the spider web and bat using patterned papers from the Main Kit. I cut the ghost on white cardstock. I decided to center my photo and keep all of the fussy cut pieces and die cuts close to it, sort of in clusters. I used the Pop Art Pink and Sunflower Shimmerz from the Color Kit to create the orange watercolor and I pulled the Wisteria Lane from the September Color Kit. I cut some of the hexagons from a Whimsical Paige Evans paper. I also cut some of the word and phrase banners from another Whimsical paper. I threw in a few Vicki Boutin black circle die cuts and some Jen Hadfield black phrase stickers. 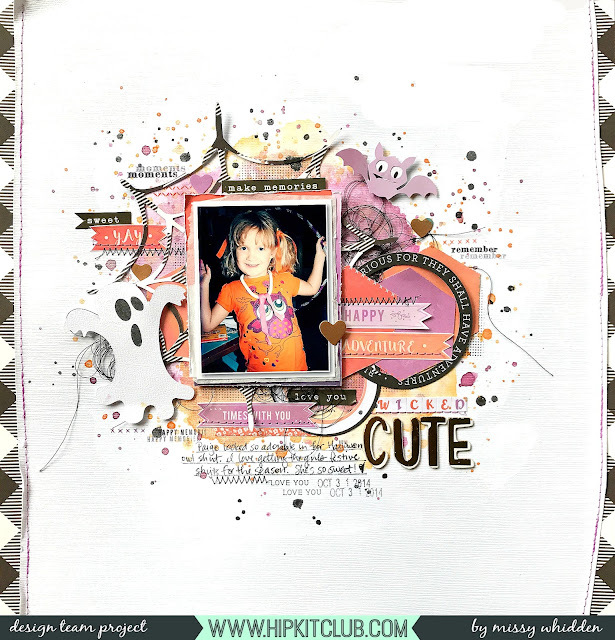 I also used some of the Heidi Swapp stamps on the background. I mixed and matched the title using some of the shiny gold Thickers and the small Whimsical alpha stickers. How cute is this ghost?! I added some black ink on a scrap piece of paper and glued it behind the eyes and mouth to make it stand out more. I raised it up off the page with some adhesive foam and then added some black thread under it. Here you can see more of the stamping detail as well as some of the Whimsical Rub-Ons. I was really surprised at all the purple and orange in the kits...at first I was scared that I couldn't make it work for a Halloween page. But it wound up coming together really easily! I layered an orange and purple Project Life card behind the photo for even more color. I love the little bat! So cute.